Originally designed as a cover for the Kingdom of Caid's newsletter, this image is available as a jigsaw puzzle! Worlds Edge Puzzles. MS by Lachlan of Cromarty. 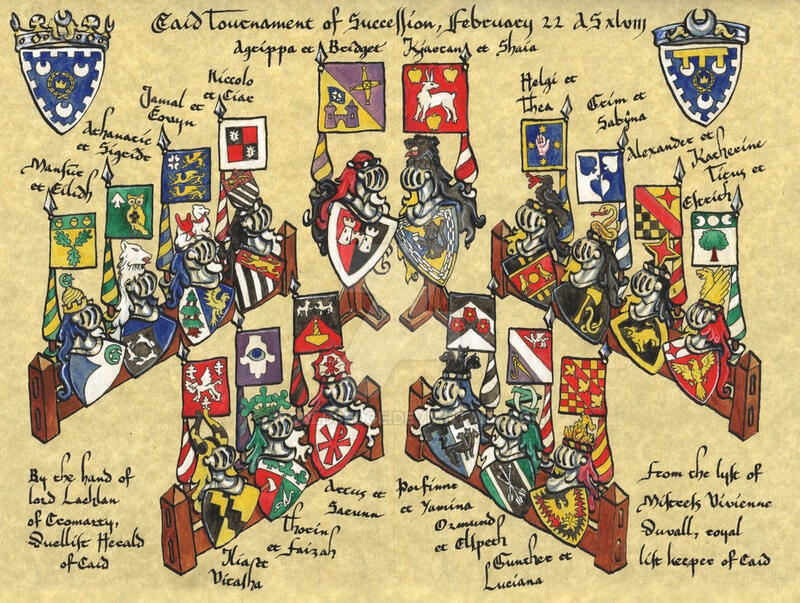 This is an armorial roll of the sixteen entrants and their consorts in the Caid Crown Tournament held on 2/22/2014 (after other challengers were eliminated in a pre-crown "crucible") The victors, Agrippa and Bridget are in the center with the other finalists, Kjartan and Shaia. The other fourteen couples are arranged according to their first round placement. 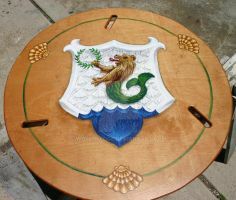 The arms in the upper corners represent the King of Caid and the Prince of Caid. 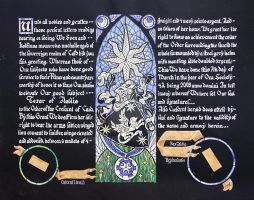 The design is not directly based on an existing roll, but is inspired by some sixteenth century examples. It is my taste to show the consorts as well as the combatants, so for each couple, the combatant's arms appear on the escutcheon, and the consorts' arms fly on a banner above. Would you mind if we shared this on our group's Twitter? Thank you for asking. That is fine with me. And thank you for the previous mention. Thank you again, Soaring Aven. Awesome work. Good job adjusting the paints even if it wasn't what you were hoping for. Thank you for your compliment. On my following piece that I just finished last weekend, I avoided the India inks and was able to use the wet brush techniques I had hoped for. Live and learn. That's the great thing about living. You get to learn. how big is this paper? Hi! Thanks for asking! The image is approximately 17"x12" (43cm x 30cm). I have a new C3 scanner, so I made it as large as could fit.